The first day of spring has arrived and the mounds and mounds of winter are finally shrinking. Evidence of grass emerges in spotty areas around the apartments at the Coolidge School. Sullivan Park is still crusted with white but soon the field will be ready to take on the all American game of baseball. Spring training had already begun and opening day is around the corner. Here in Watertown we wait for the season to begin. The resident’s at The Coolidge School get the bleacher seats facing Sullivan Park when the time comes to watch the local games unfold. Let me explain, the bleacher seats I refer to is the grand stairwell of the Coolidge School which faces the baseball field. As I wheeled by the stairwell with my dog Butchie, an adopted Deerface Chihuahua getting up in his years he discovers the sign we were looking for. Butchie was so happy to finally see grass after looking at piles of snow and nowhere to go. Most resident pet owners ran into the same problem. I bought a scoop and rake at Home Depot to start cleaning up the mess other dogs have left around the property. Doing this from a wheelchair is not an easy task. One could only wonder was it the last foul ball during the last game between teams in August. Was the sound of Louisville slugger tapping the rawhide orb in an awkward position or was it the metallic ‘ting’ sound of an aluminum bat that launched this little Sputnik in our direction? Maybe it was a dad with his young child post season practicing a pitch and a swing that sent this threaded globe into its final resting place? 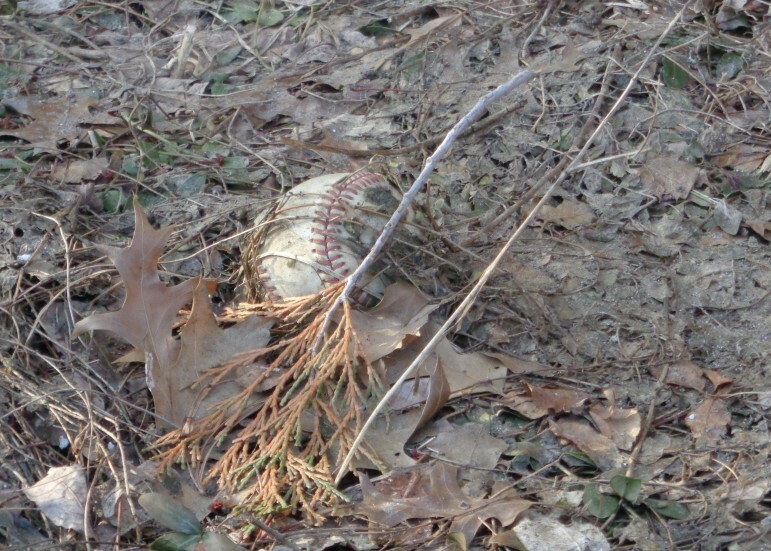 I know that this ‘Ground Ball’ ball has some kind of history attached to it. Even though Sullivan Park is not a dog park, there are conscientious people in the area that give their dog a run around the bases now and then and actually pick up their dog’s waste, but then there are others who just … well you know. In the spring I know groups go along the Charles to do river cleanup, but I would like to see dog owners who use Sullivan Park as a dog park, which it is not, and use the grounds at the apartments of Coolidge School as a dog park, which it is not, get together some Saturday, grab some bags and lets clean up the mess after the snow is gone. None of us want to see some kid slide into home plate during a game and land in a mound of … I certainly do not want to roll my wheelchair in a mound. These ‘mounds’ left behind could cost you a $25 fine. There should only be one mound on a ball field, which is one particular mound which is priceless. It is located between home plate and third base. It is called the pitcher’s mound. Excellent letter… I’ll help you.